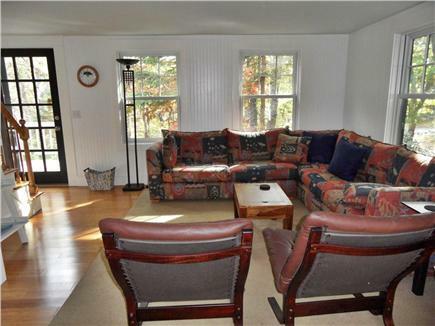 Tranquil Duck Pond is a walk away! 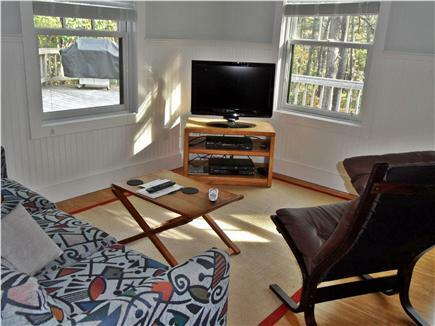 Less than 2.5 miles from Cahoon Hollow Ocean Beach, 1.5 miles from Great Pond and within walking distance of Duck Pond, this newly renovated house awaits you. Enjoy the open floor plan with its contemporary furniture, a spacious kitchen/living/dining area, three bedrooms (including a master suite) plus a TV room with a sleeping sofa, 3 full baths plus an outdoor shower, a finished walk-out basement room, and a deck--- all newly renovated and in pristine condition. 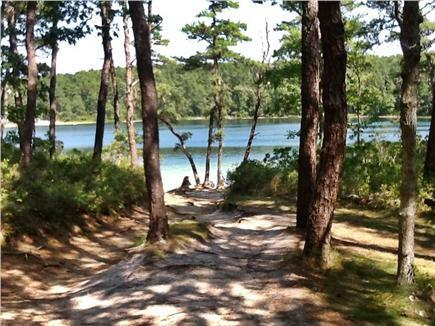 Minutes to Wellfleet Center, the bike path and bay beaches. First floor: kitchen, dining area, living room, full bath, TV room with fold-out couch, master suite (bedroom and full bath), deck with gas grill. Second floor: Two bedrooms and full bath. Both rooms can be set up with king beds or two twins in each. Long-Term Rental (1 month or more): Note: WiFi is on during July and August. If we know in advance that you would like WiFi off-season, let us know and we may be able to arrange it. Otherwise, WiFi is available at the Wellfleet Library. The online description is completely accurate. The house is very clean, everything works including the central A/C, Wi-Fi, appliances, etc. The owners are great to deal with. Having read the reviews already posted, there is little else of substance to add. Those reviews are all accurate. I definitely recommend this house, having rented a host of other properties - this house is very, very reasonably priced and excellent value. 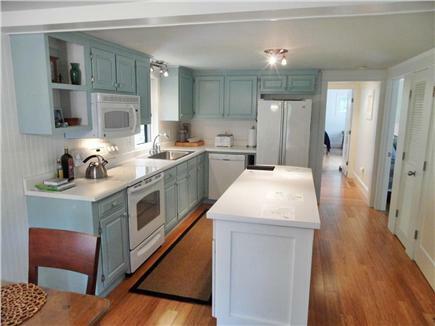 Beautifully renovated home with large deck. Close to PJ's and ponds and beaches. 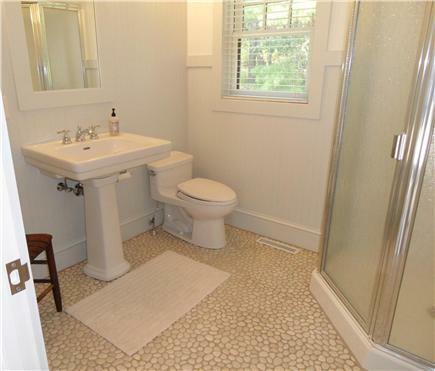 3 full bathrooms and great outdoor shower. 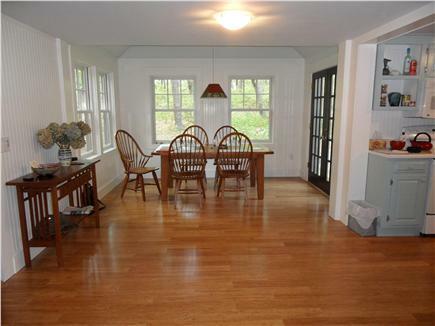 Loved the nice wainscoting throughout the house and the super functional mudroom. Lots of pleasant surprises in terms of supplies at the house -- beach toys, chairs, even flour and baking powder, which allowed for an impromptu pancake breakfast!! We had a wonderful stay at this lovely home approx. 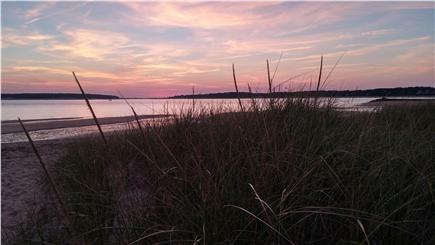 1.5 miles from LeCount Hollow Beach. The place was open, comfortable and inviting for our two families. All the bedrooms were very spacious. The kitchen was stocked with many staples that we could use. We had all our dinners on the deck and the outdoor shower was put to good use. The mudroom was perfect for storage. The property is set back from the street and was relatively quiet. This is the 3rd summer we have stayed at this property and we have been very happy. It is roomy with an open floor plan. The beds are comfortable, the kitchen is well stocked, the location is convenient. There's a large deck with a large new gas grill and 2 new, comfortable loungers. The owners are very responsive and great to work with. We will be back! Why Am I Telling You All This? And You...A Complete Stranger. I'm hesitant to post this review for fear that in the future I will be battling you for a reservation at this wonderful home. We stayed here in the late summer of 2013. 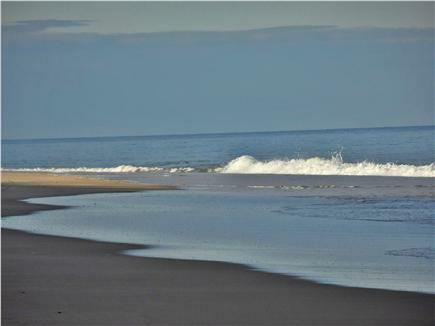 We've rented a number of homes in Wellfleet and the surrounding towns over the years, but this is probably our favorite. Picture perfect home in picture perfect setting! We just returned from a New Year's celebration at the Cape and stayed in this house. There were nine of us. Even with that number, the house was roomy and accommodating. And comfortable! Plenty of beds, blankets, couches, wine glasses and everything needed to make our stay a pleasure. Much of our socializing took place in the kitchen, and what a kitchen. Perfect for cooking while chatting and toasting the new year. 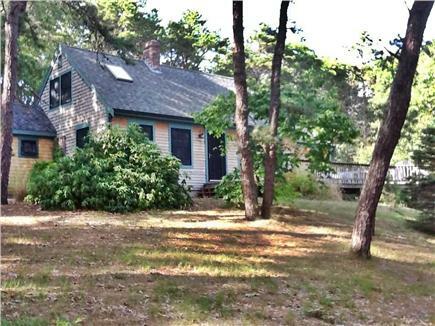 This is a perfect spot both in terms of its proximity to the village of Wellfleet and the beaches. The house itself is well laid out, comfy and tastefully appointed. Couldn't ask for a better home away from home! The pictures really don't convey how gracious, comfortable and inviting this house is. Joining friends for a New Year's Eve gathering, we thoroughly enjoyed all the lovely touches, the well-equipped kitchen, and the ideal location. I would definitely return to this heavenly spot.